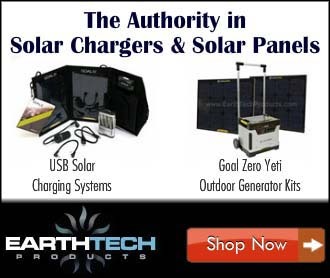 A solar panel starter kit is an excellent way to have free energy when traveling or living in an RV, trailer or cabin. There is no need to drag around a gas generator anymore. These kits are easy to install and require limited knowledge of solar technology. They are great for charging 12-volt batteries that will provide power for many applications like lighting, electronics, TV and small appliances. These types of panels can also be set up in series to provide more power. Solar panel starter kits are a nice way to get started on using solar energy. If you look at the diagram above you can see how a basic solar panel system works. The solar panel (cells) takes sunlight and converts them into direct current (DC). Which is then sent to a charge controller and stored into batteries for later consumption. Since the power is stored as DC and all of our household devices run on AC, it needs to be converted using a power inverter. Standard household AC plugs can then be plugged into the inverter. There are several types of solar panel starter kits that can get you off the grid. Depending on your requirements, you may only need one solar panel. You will need to determine your average amp usage throughout the day by observing your electrical usage. You can use the energy calculator at energy.gov to calculate your consumption. If you want more charging power (wattage) then more solar panels will be required. You can start with a basic solar panel starter kit and always add more panels if needed. Just make sure you leave some room for expansion. Renogy makes a nice solar panel starter kit. They are high output and efficiency panels for the price. They are also easy to install and come with a complete mounting kit and setup manual. They have an active forum page to help with any installation and technical issues. You can also check out their You Tube channel for helpful install and troubleshooting videos. This is an excellent kit that should cover most of your electrical needs. You will need to purchase batteries and 12-volt power converter separately. You can also expand this kit to 400 watts if more output is needed. You can see more solar panel kits here . Solar panel placement is key to getting the most out of your panels. You should try to have them mounted somewhere they will receive full sun. Generally on the roof with a tilting mount. This will allow you to move the panels into the best position to track the sun. Sun intensity will vary throughout the year, depending on your location. A good quality solar charge controller can really make a difference in how well your solar panels charge your batteries. Solar controllers regulate the voltage output from the solar panel and prevent batteries from being overcharged. Most batteries need around 14 to 14.5 volts to get fully charged. If the sun is shining and the panels are still producing energy, the charge controller will protect the battery system. Most solar kits come with a basic one, but you may want to consider upgrading to a more efficient controller. If you plan on expanding to more panels this is a good option. PWN controllers act like a switch connected to your batteries. They are good for regulating smaller load capacities and have an efficiency rating of about 80%. These controllers will prevent you from running several panels in series due to its capabilities. If you have one or two panels this should work fine. MPPT controllers can regulate high voltages and have an efficiency rating in the 90% range. This will allow you to run your panels in series. They harvest the maximum power of your solar array. They can also save on cabling costs, by increasing your voltage thus requiring lower gauge cable. The number of batteries required depends on your load. You need to decide what are you planning to run off your batteries and how much load you require. A Kill A Watt meter can help you determine the amount of power output you need. Make sure you do not discharge your batteries below their 50% capacity. This will ensure a long battery life. Peak solar energy happens between midday and peak consumption occurs in the evenings. Generally, nighttime is when lights, appliances and electronics are in use. To reliably power your dwelling, a battery bank must charge in the few hours of intense sunlight and discharge throughout the evening and night. Generally, one or two good quality 12v deep cycle batteries should suffice for most RV set-ups. Higher end RVs will already have existing batteries installed. So this step will not be needed. You can install the solar panels and charge controller to your existing converter breaker charge panel. You can check out the forums at Solar Power Talk to find out more about battery calculations. Your last step is to buy a power inverter . Depending on your RV, you may already be equipped to handle the conversion. Inverters are designed to convert a 12 volt DC battery power to 120 volt AC household power. This allows an electronic device to be plugged in and operated just as if it were being used in your home. They come in different capacity types depending on your needs. They are wired to your battery system. The Erayak 1000W Power Inverter allows you to run many devices at once, like a blender, refrigerator, tablet and TV. This inverter can be wired right into your battery bank. Depending on your electrical needs this inverter should satisfy all of them. Need help installing your solar panel kit? Hire a licensed electrician in your area from Amazon Home Services. If you are lucky, some RV’s already come pre-wired with the cabling needed for adding solar panels. This can be a big time saver. If not, then you have to snake the cabling throughout the RV. This can take some time and patience to get your cabling in the right areas. Depending on the type of RV, your wiring application will vary. The solar panels can generally be mounted on the roof. Just make sure you leave enough room to walk around and get to the parts of your RV roof for maintenance. They should be placed where nothing will cause shadowing on the panels. First measure out the size and distance of the panels and dry fit them to see how they look. Also, layout all of the cabling first before fastening and make sure you have enough to reach your destination. The panels screw into the roof with the brackets that are supplied with the starter kit or tilt kit. If you plan on using a tilt kit make sure to leave enough cable slack to allow for the panels to tilt. You should use a good lap sealant to seal up the areas around the screw holes to make a watertight seal. The best way to run your solar panel cables into the RV is through a roof or refrigerator vent. Running your own cabling will take some time to figure out. Your RV may have existing cables snaked for other applications. If applicable try to snake the solar and power cables along those routes. You will need a cable snake to make this process easier. Try to run heavier 6 gauge wire to reduce loss along the line. A general rule of thumb is the thinner the wire, the more energy is lost. Also the longer the cable runs from the solar panels to the batteries will cause some energy loss. To secure your cables, zip ties work very well. Make sure to leave enough slack on your runs for securing the cables and add additional fuses that may be required. The chart below shows the gauge cable needed for distance. The main control area can be placed in a utility closet/storage or placed with the existing power panel. This should house your charge controller and meters. Consider installing a power switch that will enable you to switch off the solar system. This can be useful for service issues and maintenance like replacing a battery. This process should take some planning. Each RV setup is different. Do some research about your RV and investigate the best spots to place your equipment. Just be patient and plan ahead. Think out the process before installing anything and when in doubt ask for help. A solar panel starter kit is much more affordable today than they use to be. They do require a bit of technical know how to install, but if you are a handy person you should have no problem tackling it. In the long run, it can save money and make you more self-sufficient.